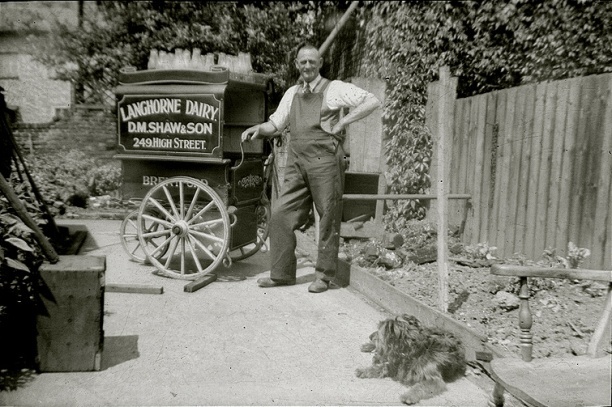 The three wheel handcart is smartly painted with signage 'Langhorne Dairy, D.M. Shaw & Son, 249 High Street, Brentford'. Donald Mackay Shaw, dairyman is recorded in trade directories for 1933 and 1940 at this address (but not 1931: this was still a butchers). Telephone directory entries for 1950-1955 show D J M Shaw, photographer at this address: Donald James, the son of Donald Mackay Shaw and grandfather to Mark.